With the recent drop in gasoline prices perhaps you have begun to wonder exactly how close to historical lows are we? 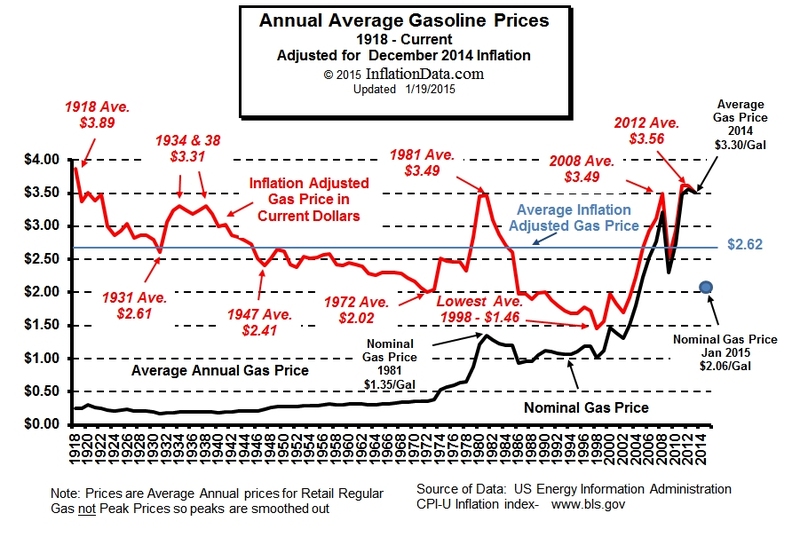 If so we have updated our famous Inflation Adjusted Gasoline Price Chart. It shows where we stand on an inflation adjusted basis. Back in 1918 gasoline was $0.25 a gallon and by 1932 prices had fallen to 18 cents a gallon! But as we all know over the last 100 years the purchasing power of the dollar has fallen drastically so in order to get the true picture we can’t just say that the lowest price of gas was 18 cents per gallon, we need to adjust the price for inflation. When adjusting for inflation there are two prices… the first is called the “nominal price” and that is the actual price you would have paid for gas at the pump.